An ancient Indian proverb holds that "everything good is found in ginger." And he's right about flavor and especially about medicinal properties. Originating, apparently, from some tropical area of ​​the Far East, the cultivation of ginger has spread to almost all the tropical regions of the world. It usually takes advantage of the fresh rhizome of the plant, although it can also be purchased in powder or pickled. Spicy and lemony, this underground stem, the star of Asian cuisine, not only flavors rice stews, sweet and sour sauces, desserts and hot and cold beverages, but is considered an effective remedy for the relief of intestinal problems. , nausea, vomiting ... apart from being a good anti-inflammatory and antiseptic. The main producing country in the world is Jamaica. Other producing countries are: China, India, Nepal, Thailand, Sri Lanka, Nigeria, Bangladesh, the Philippines. The multiple virtues that are attributed to ginger are due mainly to its richness in volatile oils. It also has phenolic substances (called gingerols, shogaols and gingerones), proteolytic enzymes, linoleic acid, vitamins (especially vitamin B6 and vitamin C) and minerals (calcium, magnesium, phosphorus and potassium). For dizziness and nausea. Reduces the symptoms associated with dizziness. It is very useful for nausea of ​​pregnant women. For bad breath. An oriental technique involves using a small piece of pickled ginger with vinegar to remove bad breath and freshen the mouth after meals. Calorific. Ginger can help sweating and is very useful in colds and flu. Circulatory tonic The combination of the sweat stimulus and the bloodstream induces the movement of blood to the periphery. This makes it suitable for chilblains, hypertension and fever. Ginger also inhibits platelet aggregation, which helps prevent cardiovascular disease. Antioxidant Ginger is rich in antioxidants, which slow down the aging process. 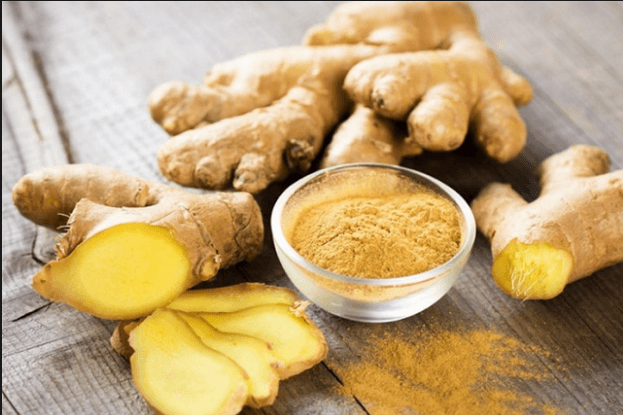 Anti-inflammatory Its gingerols, the main active components of ginger and responsible for its spicy taste, are volatile oils with very powerful anti-inflammatory properties. People with rheumatoid arthritis experience relief in their pain and swelling and improvements in their mobility when they consume ginger regularly. Anticancer. Gingerols can also inhibit the growth of colorectal cancer cells, as suggested by the results of different studies. Muscle activity It has a high content of magnesium, calcium and phosphorus, minerals that actively participate in muscle contraction and nerve impulse transmission. It is, therefore, a useful remedy to prevent and combat muscle spasms and muscle weakness. In high doses it can cause gastritis and is not recommended in case of gastroduodenal ulcer. Pregnant women and nursing mothers are recommended in low doses and for short periods. It is also not suitable for children under 6 years of age. Ginger is often said to have a fresh, exuberant and spicy scent. Remember citrus, especially lemon, some cologne waters, fresh grass and a little wood, but sweet and velvety. It combines well with soy sauce, vinegar, lemon, sesame, oil, and miso to make sauces, vinaigrettes and condiments. Added only enriches any food that is not very strong or sweet, such as fish, rice, vegetables or fruits. The other option, widely used by oriental and natural cooking, is to grate it, squeeze the pulp obtained and add that juice at the end of cooking, just before eating it. Half a teaspoon of juice per person is recommended. Japanese pickled ginger or gari, usually accompany the sushi and maki to give crispy texture and a touch of acid and salty flavor to clean the palate between bites. The fresh rhizome should be acquired smooth, without wrinkles. The rhizomes can be frozen, peeled and in pieces or grated. In the fridge, they stay fresh until a couple of months. Ginger powder should be purchased in small quantities to preserve its aroma and freshness. It should be stored in a dark, cool and dry place. I noticed that you have been using my service for a while but most of your posts are plagiarized from other websites. That goes against the principles for which Steemit was born. Could you please change your blogging style to one that is not considered abuse by the community? "The cultivation of ginger has spread to almost all the tropical regions of the world. It usually takes advantage of the fresh rhizome of the plant, although it can also be purchased in powder or pickled."